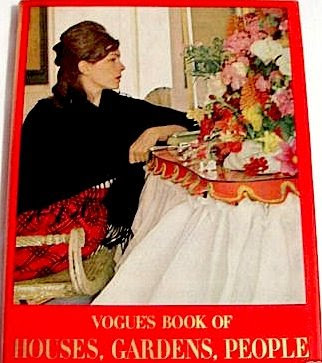 Bookride: Vogue's Book of Houses, Gardens, People 1968. Lawford, Vreeland, Horst. VOGUE'S BOOK OF HOUSES, GARDENS, PEOPLE. The Viking Press, New York, 1968. 1968. While a younger generation were manning the barricades or kicking out the jams, the older rich beautiful people were having their homes and gardens arranged to perfection and photographed. This was a more elegant age before the TV makeover, trash culture and the cult of mass celebrity. Horst was the appointed photographer. He was the Bruce Weber of his time known for his cleverly lit, painstaking photos of buffed guys hawking their brawn under a Meditteranean sun, beautiful girl models in swimwear and one of Vogue's best-known photographs, Mainbocher Corset (1939) which was 'homaged' by Madonna in a video in the late 90s. That's him below photographed in youth by his one time lover and mentor Hoyningen- Huene. "...the houses and rooms, furniture and collections, gardens and daily lives of some of the most interesting people in America and Europe are here presented in over two hundred beautiful colour photographs by Horst...from Miss Doris Duke's extraordinary Muslim-inspired house near Honolulu, and State Senator and Mrs. Taylor Pryor's Oceanarium at Sea Life Park, also in Hawaii, we are transported to the revived Georgian splendours of Mr. and Mrs. Desmond Guinness's. Irish castle, and to Mr. Henry Francis du Pont's world-famous estate at Winterthur, Delaware; from the work-rooms and living-rooms of the brilliant designer Emilio Pucci in Florence, to the Duke and Duchess of Windsor's magnificently appointed house in the Bois de Boulogne, and to Baron and Baroness Philippe de Rothschild's unique Chateau de Mouton..there are chapters about the young: Mr. and Mrs. Carter Burden, Jr., in their New York apartment, Mr. And Mrs. Cy Twombly in their Roman palazzo, Lord and Lady Eliot at their ancient family seat in Cornwall...this book provides an opportunity to see how a number of well-known and less well-known people live during their private hours, among the possessions they love and in the surroundings they have planned or improved or cultivated.. for anyone curious about the personalities and habits of some of the most attractive and creative people of our time." Bruce Weber in, in a 1992 television documentary on the elderly Horst, gushed '...the elegance of his photographs ... took you to another place, very beautifully ... the untouchable quallity of the people is really interesting as it gives you something of a distance ... it's like seeing somebody from another world ... and you wonder who that person is and you really want to know that person and really want to fall inlove with that person'. An archive of Horst's photos built up by a German businessman sold last year at auction for several million dollars. Although ignored by Martin Parr and the more serious photo people his name (and also his associates George Platt Lyne and Hoyningen-Huene) are always worth looking out for on books. VALUE? No copies available for less than $350, a fine copy is listed at $1000, hard to find a respectable copy at less than $450. Its outlook is probably OK as it is becoming harder to find and as time goes by it may take on a period charm. Photo is still very bankable - although this isn't Horst at his best or most typical. There are some photos from it on Flickr including a shot of the Duke Windsoer in a suit so boldly checked that you'd have to be a royal in exile or a welching bookie to get away with it. Avoid ex library copies (unless ex library lite) - a copy sits on a web mall at an outrageous $450 described thus - 'Brodart-covered dust jacket of ex-library reference book (never circulated) with usual marks and stamps. Pages 93-108 are bound in duplicate, Pages 81-92 are missing. Interior pages are clean, tight, and unmarked, except that book opens at page 80. All proceeds go to our public library.' Ex Lib and defective -the kind of copy that should be tossed in the recycling box or priced at $10 for the impecunious Vogue / I.D. collector, if such exists. I have a copy with the red dustcover 1968 "Bodley Head London". How do I know it's worth ? I am looking for this book. This book is very hard to find specially in Europe. I have an original in very good condition and will be in auction soon. I will include information as soon as it goes live so you could bid if still interested.